Kiranjeet (Kiran) Purba has led an interesting life. Born in Malaysia, at just 18 he moved to Melbourne, on his own to complete his final year of high school, before eventually heading back to Kuala Lumpur to complete a business degree with RMIT. Years later, after living and working in several countries, Kiran has returned to Melbourne to lead Marketplace Quality for UberEATS in Australia and New Zealand. Kiran's story is not an unfamiliar one. Like many young adults, in his final year of high school, he found himself questioning the path laid out for him. Studying within a science and engineering stream he quickly realised that it wasn't a field he was truly interested in so after finishing year 12, he made that hard decision to move back home and take the time to really think about what he wanted. "I took a step back and went through that whole process of asking 'Who am I?' and 'What do I want to do?' ... that kind of defining moment," explains Kiran. Over the next two years Kiran underwent a time of transition and self-discovery before enrolling offshore at RMIT in Malaysia to study a Bachelor of Business (Economics and Finance). After graduating in 2010, Kiran found himself drawn back to Melbourne to pursue a Master in Accounting and Financial Management. It was during this time that Kiran truly began to hit his stride, working as a subject administrator for statistics in the university sector as well as operating as a logistics specialist for the Marriner Group, which runs four landmark heritage theatres (including the Forum), and a variety of function and events venues in Melbourne's CBD. After completing his postgraduate studies, Kiran felt like he was being offered better work opportunities in Southeast Asia - so he moved home again to start his first corporate position with Maybank and gained invaluable experience in management. And so began his career with Uber and UberEATS, which has so far spanned nearly four years, but will no doubt span many more. Since first being employed by the start-up Kiran has worked for the company in Malaysia, Singapore, and as of late 2016, Melbourne. 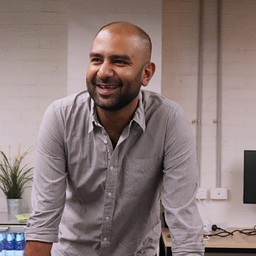 We recently went down to UberEATS HQ in Cremorne to chat to Kiran about his fantastic accomplishments and ask his advice to anyone just starting out.